Whey protein is a nutritional supplement that adds high-quality milk protein to your diet. Whey protein can help you to add muscle mass as part of your overall fitness plan, and the timing of whey consumption can affect both muscle recovery and muscle building following a workout. As with any supplement, however, seek the advice of a dietitian or sports nutritionist before adding whey protein to your daily diet. Whey and casein are the two proteins found in cow's milk. 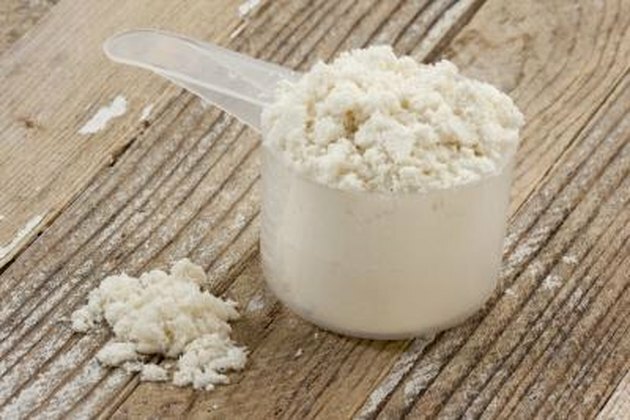 Whey protein, the less abundant of the two, offers the highest biological value of any food protein, claims the University of Illinois McKinley Health Center. In other words, your body is able to use whey more efficiently than any other protein. Whey is therefore considered a fast-acting protein, while casein, which you digest and absorb more slowly, is known as a slow-acting protein. Both types of protein, as well as how you time their consumption, can play a role in building muscle. Taking whey protein before bed allows your resting body to rapidly benefit from the amino acids it contains. Whey protein, because it comes from an animal, contains all the essential amino acids you need to include in your daily diet, especially when you are building muscle. The branched-chain amino acids leucine, isoleucine and valine get incorporated into your muscle tissue particularly quickly, as they do not require metabolism by your liver, unlike non-branched-chain amino acids. Because your body repairs and builds muscle tissue during periods of rest, consuming whey protein before you go to bed supplies your recovering muscles with amino acids at that time. Despite the high-quality protein it provides, whey offers greater muscle-building potential when taken at times other than before bed. For example, consuming fast-acting whey – along with carbohydrates – prior to and following a strenuous workout not only helps to prevent muscle breakdown during exercise but also increases the rate of protein synthesis needed for muscle recovery and growth. Sports nutritionist Nancy Clark suggests that slow-releasing casein may be preferable to whey protein at night to allow a steady, gradual influx of amino acids to your muscles as you sleep. Taking whey protein before bed may not be the optimal time for maximal effect of this supplement; however, it nonetheless supplies your muscles with the amino acids needed for growth. Although nutrient timing matters for optimal fitness, the quality of your nutrition is also critical to meeting your fitness goals. In other words, consuming high-quality protein such as whey is essential for building muscle, no matter what time of day you take it. Do You Drink Whey Before or After a Workout?